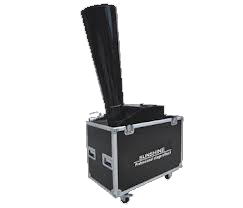 THIS CO2 AND DMX 512 CONTROLLED CONFETTI BLOWER SHOOTS CONFETTI UP TO 35 FEET HIGH AND HAS A BACK FEEDER TO KEEP THE SHOWERS GOING ALL NIGHT LONG. STANDS ON 4 WHEELS SO YOU KNOW ITS EASY TO MOVE ALONG THE STAGE BY EITHER YOU OR THE DJ OR JUST ABOUT ANYBODY. Disclaimer:ClubSparklers is not responsible for any misuse that leads to any injuries.Club Sparklers is also not reponsible for any professional instalation beause this equipment DOES NOT require it. You will be solely responsible if you decide to modify or profesinally instal the equipment to meet your standars. The special effects equipment serve there purpose as is so we highly recomend that you dont make any changes.